AC/DC’s 45th anniversary is being marked with a new series of coins from The Royal Australian Mint. In the spirit of the band’s 1990 classic, “Thunderstruck”, the Mint partnered with Questacon – The National Science and Technology Centre to strike its AC/DC coins with a bolt of man-made lightning. The experiment was conducted in the Caged Lightning exhibition at Questacon, which produces lightning using a Tesla coil. Ten AC/DC 50 cent pieces, appropriately featuring the famous high voltage logos and design elements from AC/DC albums, were ‘Thunderstruck' with 3,500,000 volts of lightning. “AC/DC is famous for their electrifying energy. It’s in their music, the titles of some of their songs, even their insignia,” says Royal Australian Mint Chief Executive Officer Ross MacDiarmid. “The Mint thought that such an iconic band deserved high voltage coins and an electrifying launch to match. Ten of the 30,000 coins were ‘Thunderstruck’ and will be randomly sent to ten customers who order their AC/DC – 45 Years of Thunder Uncirculated Coin through the Mint’s online store or Contact Centre. The Mint’s production of two AC/DC coins adds legal tender status to the band’s list of accolades. The second coin minted for AC/DC’s 45th anniversary is the Mint’s first ever nickel-plated $5 coin. Not only black, its detailed design is minted on a triangular blank to resemble a guitar pick. 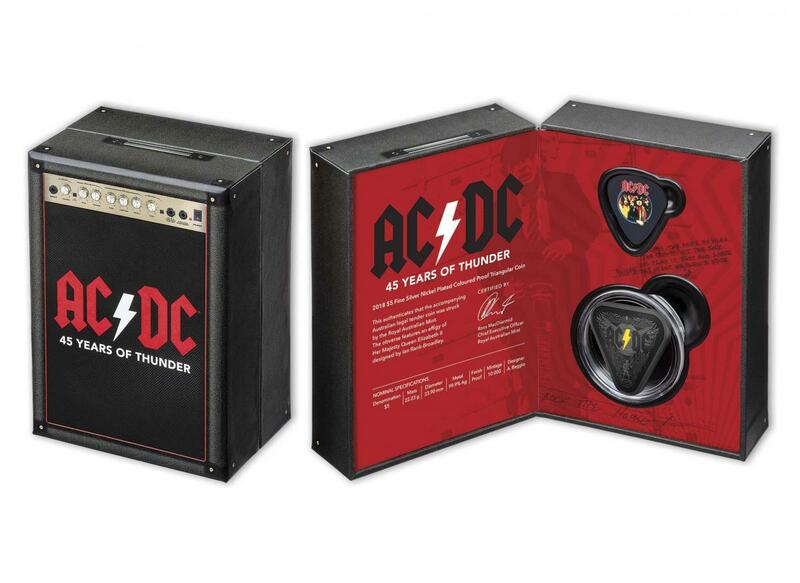 The design elements have also been drawn from AC/DC’s album artwork and the amp-inspired packaging includes an actual guitar pick. The new coins are both officially licensed AC/DC merchandise and are available now from the Mint’s online store at eshop.ramint.gov.au or by phoning the Contact Centre on 1300 652 020. AC/DC have recently regrouped at a Vancouver recording studio to work on a new album that will reportedly feature unused recordings by late guitarist and band cofounder Malcolm Young, who passed away last November at the age of 64.